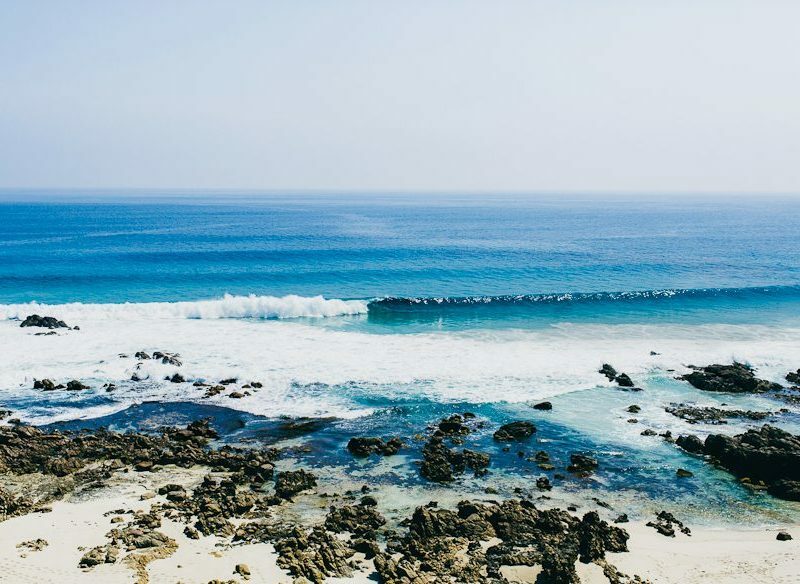 Surfers flock to Dunsborough for its perfect breaks, like these off Cape Naturaliste (photo: Aimee Dehaan). Perthites are privy to an otherwise little-known gem of a town passed en route to popular Margaret River, with everything in place for the perfect weekend away. Three years ago, it was yoga that first brought me to Dunsborough. A friend and I signed up for a week-long health retreat with hopes of self discovery and a chance to switch off. It was as clichéd as we’d hoped, our days were filled with sun salutations, juices, meditation classes and a lot of reflecting. But, by the end of the week, it was the West Australian coastal town that had taken our fancy, rather than the downward dogs. Since then, I’ve been a regular visitor, located my dream holiday house among the treetops overlooking the ludicrously beautiful Eagle Bay Beach, and comprised a long list of favourite cafes and restaurants that are constantly rearranged in pecking order. Spectacular views from the balcony at Wise Restaurant (photo: Aimee Dehaan). West Australians have been flocking to the tiny Margaret River region town since the surfing revolution began in the late ’60s. Back then it was a nondescript coastal centre, acting as the gateway to adventure, and then shortly thereafter serving the burgeoning wine industry. But over the last 10 years Dunsborough has been quietly transforming into a spunky little holiday destination that locals compare to Byron Bay circa 1995. Every January, its population quadruples as the who’s who of Perth make their annual summer holiday pilgrimage south to the family holiday house. In 2013 it won the WA Top Tourism Awards’ best town of less than 5000 award, and it trumps Margaret River town geographically alone – it’s 50 kilometres closer to Perth and backs onto the postcard-perfect turquoise waters of Geographe Bay, while Margaret River town is a couple of kilometres from the coast. There’s also its burgeoning beer brewing industry, a serious coffee culture, a community of yogis, beautifully curated and wallet-breaking boutiques and artisans galore. And don’t forget the restaurants, rustic general store and, of course, a booming health and wellbeing scene that dovetails nicely with the rich surfing history, creating one of the most unique holiday and weekend spots Australia has to offer. “My favourite time of day in summer is about 6pm, when all the families come out to paddle on the beach at dusk after one of those really hot summer days, and you can just see their silhouettes dotting the horizon,’’ muses Amanda Ellis, manager of one of the town’s breweries, Occy’s Food and Brews Dunsborough. On any given Friday afternoon you’ll find the fairy light-strung terrace of Occy’s teaming with thirsty locals, sampling their fix of the carefully curated international beers of the week or any number of local brews. Dunsborough’s suburban coastal walk which runs alongside Geographe Bay might be just the thing you need to clear your head. The path winds in and out of sight of the ocean, weaving through bush with the juxtaposition of cute fibro beach shacks and monstrous, cookie-cutter McMansions jostling side-by-side. A healthy start to the day at Goanna Gallery & Bush Cafe (photo: Aimee Dehaan). For the more adventurous, there are kilometres of coastal bushwalking trails that form part of the Bibbulmun walking track, which, in its entirety, spans over 1000 kilometres from Perth to Albany. We opted for a more sedentary-style walking tour. South West Eco Discoveries, a hop-on-hop-off mini bus tour run by brothers Ryan and Mike White that incorporates short coastal walks, dolphin spotting, flora and fauna facts along with anecdotal local knowledge, such as which outcrop of rocks “is where you learn to do bombies as a 15-year-old”. Raised on a coastal surfing farm near Margaret River, the brothers have lived in the area their whole lives, making their guided tour a little like being taken out to see the sights by an old friend. Post-exercise, the obvious next step is brunch. There’s Mealup Cafe Dunsborough in the centre of town where you’re just as likely to spot visiting celebrities as you are young families or friends on a girls’ weekend. There’s absolute beachfront dining in the dunes at Bunkers Beach Cafe, where you can watch a constant throng of bleached and bronzed surfers trot past on their quest for surfing nirvana. The makeshift design of Albert + Nikola (photo: Aimee Dehaan). For coffee purists, Albert + Nikola is a hole-in-the-wall cafe that shares space with a communal office arrangement of creatives. Grab a coffee from Albert + Nikola’s hole in the wall (photo: Aimee Dehaan). Or across the other side of town nestled in dense gum-tree bush there’s Goanna Gallery & Bush Cafe where on weekends a queue spirals into the car park as locals patiently wait their turn to peruse the simple yet innovative breakfast menu. Have the Indo Breakfast complete with spiced coconut rice, a fried egg, spinach, avocado, pesto coriander and sweet soy dressing. In Dunsborough, wine tasting is never far from your thoughts – even at brunch. After all, the town is located within one of the world’s leading wine regions and the list of wineries within easy reach is long and lauded. Palmer Wines is a favourite with locals, while Wise Wines has arguably the best view in the area, as well as a tavern licence; spend an afternoon on the patio sipping a local chardonnay. Across the road from Wise Wines is Eagle Bay Brewing Co. If you only go out for lunch once during your stay, make it here. It’s set on a working sheep and cattle farm, which happens to boast killer views out over Bunker Bay. With its manicured lawns that tumble onto rolling pastures hiding a sandpit and toys for the kids and laid-back trendy vibe, it’s one of the most popular hangouts in the area. Eagle Bay Brewing Co’s lovely al fresco space (photo: Aimee Dehaan). “We’re busy most days, there’s a school down the road so often we’ll get mums in for lunch before they have to do pick-up,’’ says Adrian D’Espeissis, one of three siblings who are at the helm. Like most wine regions, the dinner options in Dunsborough are a little limited, but don’t fear, change is brewing. Piari & Co, hidden in a block of suburban-looking shops, is packed almost every night. The menu is ever-changing and like most restaurants in the area the emphasis is on sourcing local and, where possible, organic produce. Add its high ceilings, simple white décor with a nod to beach chic, along with better service than you’ll find anywhere in Perth and you have yourself a winner. For a more relaxed evening, Clancy’s Fish Pub is located on the outskirts of town. It’s as famous for the music performers it attracts (Tijuana Cartel played in October) as it is for its fresh seafood served overlooking native scrub. So what more could you want from a trendy coastal town? Shopping, of course. There is a handful of boutiques that satisfy that urge for holiday purchases. For the fashion savvy there’s Milc Homewares, stocked to the brim with designer labels. Handmade homeware from Merchant & Maker (photo: Aimee Dehaan). Next-door is Beach Lifestyle Living with an equally enticing selection of homewares and trinkets. Around the corner is Merchant & Maker, which opened in June, offering everything from organic baby formula to recycled-paper birthday decorations and fresh fruit and veg. It’s worth popping in, before making a beeline across the road for more designer threads at Adam Heath. The beauty of Dunsborough is that it caters to every holiday whim. You can jump in the car and follow the coastline towards the most westerly point in the South West region (the most westerly point in Western Australia is near Exmouth) or beach hop from family friendly Meelup Beach to Eagle Bay and then on to famed Bunker Bay. The bustle of town is only a few kilometres away, and yet the breathtaking beaches are almost deserted, even on the most glorious summer’s day. In stark contrast to the serene beauty of this side of the cape, the opposite side is where you’ll catch dinged-up 4WDs overflowing with bronzed locals on their daily surf check, stunted coastal heather growing at the mercy of the often whipping winds, and a feeling of remoteness, even during the hectic summer months. If you were to play the game of conjuring up the ideal holiday town where eating, drinking and soaking up the sunshine were the order of the day, Dunsborough would rate every time. The more you visit, the sharper your desire to return – and isn’t that what a beachside break is all about? Lanterns Retreat period B&B (photo: Aimee Dehaan).